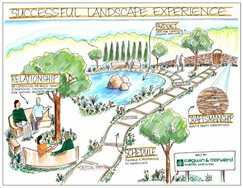 A drawing illustrating a successful landscape experience. Cagwin & Dorward in Novato, CA. The first step in hiring a landscaping company is to determine if you need a designer, architect or contractor. If you plan to do more than one aspect of your yard it is wise to go with a designer or architect because they are skilled at creating plans for entire spaces. Furthermore, if your yard needs retaining walls or extensive grading an architect is your best bet. A landscape contractor is a good choice if you just want one simple element, such as a patio or walkway, installed. Many landscape designers and architects offer complete design and build services. This means that they have their own construction crews that come in and install the design they created for you. In-house firms like this pride themselves on good communication and on schedule results. 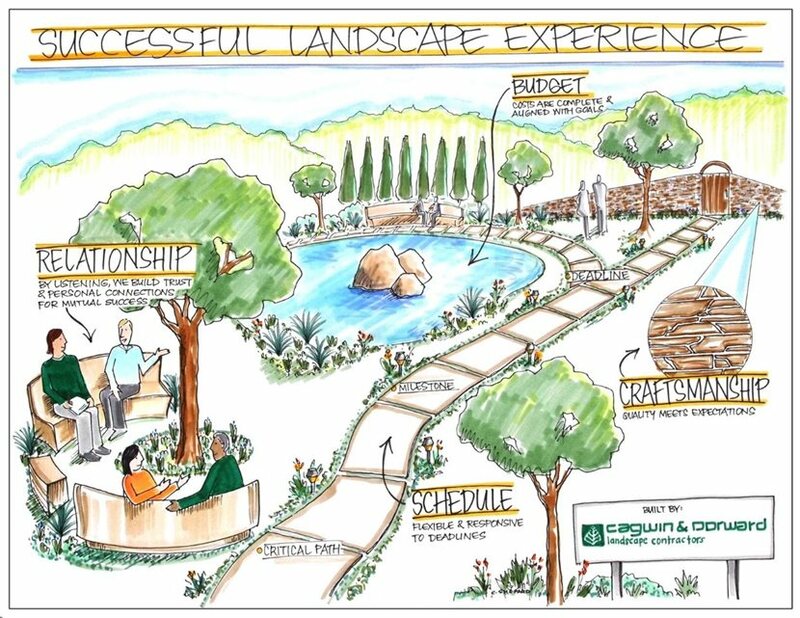 Some landscape designers and architects offer project management services. This means that after they have designed your yard they will sub-contract out the installation to one or more contractors. This is most successful when the designer or architect has a pre-existing relationship with the contractor. When hiring a landscape company it is important to check professional affiliations and references. If working with a landscape designer the organization to check is the APLD. If working with a landscape architect the organization to check is ASLA. If working with a landscape contractor the organization to check is PLANET or your state's landscape contractors association, sometimes called a landscape and nursery association. You can also check the company's record with the Better Business Bureau. Additionally, don't be afraid to call the company's references. You can learn a lot by talking with a homeowner who has worked with them before. It is a good idea to get estimates or quotes from three different companies. This way you know the price of your project is fair. This also gives you a chance to see what is available at different price points. Some companies only do high-end designs, while others are geared towards affordability. Remember to weigh both the cost of the work and the quality of the work when deciding who to hire. When meeting with a landscape professional for the first time it will help if you have an idea of what you want. Do some research and learn about your design options. A good place to start is with these landscaping ideas and landscaping pictures.